IN the Pyrénées-Orientales department of southern France, around the city of Perpignan and out toward the village of Rivesaltes, signs declare the roads to be “route des vins,” or wine routes, announcements made redundant by the grape vines growing along the roadside and the stands hawking the local Muscat wine. But there was another route, unmarked, long taken in this region. That was the route of the segregated and unwanted, a path walked from 1939 until 1979, but only now to be commemorated by a memorial and education center. 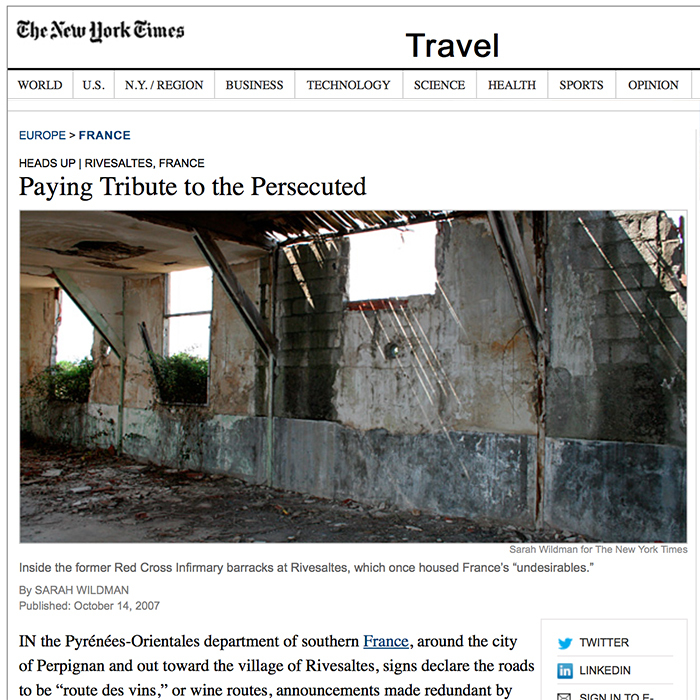 This was the ugly path that led to southern France’s internment camps. The memorial, scheduled for completion in three years, will stand at the camp outside Rivesaltes, a place that already draws visitors who come to pay homage to the persecution faced by those who were considered undesirable: Spanish Republican families and International Brigades fleeing Franco at the end of the Spanish Civil War; foreign Jews rounded up by the Vichy French government; Roma, or Gypsy, families; Algerians who fought alongside the French during the French-Algerian war; and others. Next year, builders will break ground on the memorial, designed by the architect Rudy Ricciotti. It is being planned with an eye to the symbolic: four 50-year-old acacia trees will be planted, honoring the four main populations interned in the camps. There will be stark spaces — including a long, somber concrete corridor to “inspire silence,” according to the designers. Exhibition and learning annexes will be built in what was known as “Ilot F,” or Camp F. Outside, the architect will let crumbling barracks stand as silent witnesses. The project is being led by the regional government and is also supported by groups like the Fondation pour la Mémoire de la Shoah in Paris, the International Red Cross and Red Crescent Museum in Geneva and the United States Holocaust Memorial Museum in Washington. It is a large project. Its price tag, projected at more than 18 million euros, or $26 million, has been hotly debated in the French press. “Is it necessary to put 20 million euros into the memorial of Rivesaltes?” asked the local newspaper La Semaine du Roussillon in January. Meanwhile, visitors continue to drift to the site, pulling off the A9 autoroute between Perpignan and Rivesaltes, following the signs to the camp and turning on to the tiny Route d’Opoul, where modern windmills barely turn in still, hot air. The paved road quickly becomes a dirt track. At a turn in the road, steles of stone, festooned with plastic flowers and flags and small marble carved plaques, are dedicated to those who were corralled into the barracks that stand on this dusty, inhospitable plain. The barracks of Rivesaltes were originally built in the late 1930s to house the French army. But their purpose quickly shifted. When Barcelona fell at the end of the Spanish Civil War, “you had a massive immigration to France,” said Jean-Marc Dreyfus, a historian who was recently named lecturer in Holocaust Studies at the University of Manchester in Britain. “At least 500,000 people arrived; it was an exodus. And France did not have a generous immigration policy at this time.” The camps were built both to shelter the people, said Mr. Dreyfus, and to isolate political activists. The conditions were terrible. For two years, thousands lived in unprotected tent cities surrounded by barbed wire on the nearby beach at Argelès-Plage, now a resort town. Rumbling down the dirt road to the camp, you see the 70-year-old barracks stretch in all directions. The effect is both humbling and overwhelming: a bleak vista of ruined cement shelters, crumbling more each day. But the numbers on barracks walls are still visible. Rusted barbed wire is coiled on the ground; bullet casings nestle in the dirt. The latrines, cement block structures, remain — sturdy, ominous sentries. Today, large posters detailing the history of the place stand at the entrance to Camp F, a site of 104 acres purchased from the French Army by the Pyrénées-Orientales department with an eye to building the memorial, the first of its kind in the south of France. Meeting the director of the project, Marianne Petit, on the site on a hot summer day, I was joined by Jacques Lavergne, a filmmaker, who was scouting sites for a project commemorating the persecution of the Gypsies. From 1939 to 1940, the Vichy regime began putting “enemy aliens” in these camps, alongside Spanish Republicans. These aliens were a polyglot assemblage of Jews and others who had fled the Nazis, and antifascist veterans of the Spanish Civil War. Hundreds of foreign-born Jews in the southern “free” zone were sent to the camps. So-called “a-socials” — homeless people and Gypsies — were imprisoned as well. By July of 1941, French Jewish activists and Red Cross officials visiting Rivesaltes and other camps were revolted by the conditions.